I’ll spare you the details but in May of 2015 Dribbel unexpectedly took ill. Just colic we thought, not uncommon in horses. The vet came by numerous times but it didn’t get better. I even called the vet in a couple of times during the night for emergency visits. But nothing we tried worked. I had to let Dribbel go 3 days after he first got sick. It wasn’t fair for him any more, his body couldn’t handle it anymore and this couldn’t go on any longer. In that moment, you don’t have time ti think. It’s acting first and doing what is best for my horse friend. In hindsight I’m thinking “what if”. What if i tried other things, got the vet out even more, pushed even harder for different treatments? But rationally I know I tried everything possible. Nothing could have changed the outcome. And the choice I had to make was the only fair and right one I could have made for Dribbel. I catch myself still talking about Dribbel when I speak of my horses. Then I’ll say “I’ll go give Adanto and Dribbel a carrot real quick” while that’s not the case anymore. Or I expect to see his stubborn head with his big bushy manes looking through the window in his stable. Whinnying because he wants to go outside and barely leaving the door in its hinges when I open it. And now, almost a year later, his stable is no longer empty. 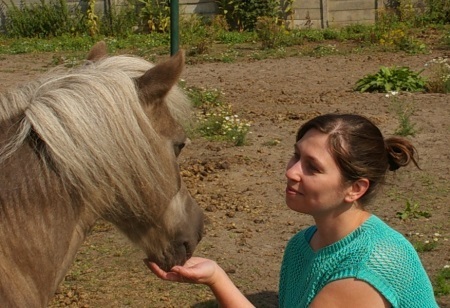 There is a new furry friend who can call his stable his home and now has a place in my heart as well. His name is Iwan, and although he will never take Dribbel’s place to replace him, he has just as much right to be loved and taken care off as Dribbel had (and just like all my other animals have). I’ll write more about Iwan in another post, but believe me when I say he’s looking out of that window just as stubbornly as Dribbel always was. If that wasn’t enough sadness and loss, I had to say goodbye to another big furry friend. In October, 5 months to the date off Dribbel’s passing, the hard choice of letting go my big dog friend Butler had to be made. Butler was already 13 years old, nearly 14 and that’s pretty old for a big happy lab. His body couldn’t go on anymore, and his mind sometimes couldn’t either. He got a little dementia sometimes. I grew up as a teenager with Butler being a puppy and he was best friends with Dribbel. They really loved to play together. The house is empty without him and I miss him when I go take care of Adanto and Iwan. He would happily wait at the gate until I got back, or if he got the chance he would quickly jump in the mud. Sometimes I think “ooh I have to go walk Butler” while right after that I think “oh I don’t need to do that any more”. And as crazy and contradictory as it might sound, you get used to it in a way. I still miss him very much and the house is very empty without him, but at the same time the missing is something you get used to. The feeling of an empty house stays, but it changes. It’s not easy to explain feelings because they don’t always translate very well to text, but if you ever had a furry friend you loved very much you probably know what I mean. For some people this might all sound a bit dramatic. But I was raised with the idea that animals become part of a family, an extra family member. Whether it’s a dog or a horse, they become family. That’s what I grew up with. Animals are a responsibility, a dedication that you have to take when you take in an animal and one in which you always have to think of the welfare of the animal. This also means you have to make tough decisions to let a friend go. It’s the down side of having animal family. So when living becomes suffering (in whichever way) you have to make that choice. In situations like that it generally isn’t too soon, but you can be too late sometimes and that’s not something anyone should want. Loving is also letting go. And while the pain is still in my heart and I still morn their loss, in that same place there is a lot of love, beautiful memories and gratefulness that I had the privilege to get to know Dribbel and Butler and was able to call them family. I will never forget them. And with love and gratefulness I will always think back to them. Things are OK now, they are no longer in pain and hopefully they found each other after crossing the rainbow bridge.